Let me just start this post by saying "Hash Browns+Mashed Potatoes+Baked Potato." Do I have your attention yet? I thought that might do it. This side dish brings it all together: The crispy outside of griddle hash browns, the smooth, creamy goodness of mashed potatoes and the cheese, bacon and sour cream toppings of a baked potato. It's just ridiculous. I don't really need to say much more than that so without further adieu....let me present Mashed Potato Cakes. In a bowl combine potato, bread crumbs, butter, egg, egg white, cheese, garlic, chive, bacon bits, salt and pepper. Stir well. Make 10-12 patties (or cakes) out of the potato mixture using approximately 3 Tbsp of mixture per patty. You can lay the patties on wax paper while completing the patty making process. Heat a skillet over Med-High heat and drizzle 1 Tbsp of olive oil in the skillet. Place 4 patties in the skillet and pan-fry until it becomes a dark golden brown. Flip the patty and cook the other side. You will do 3 batches of 4, drizzling 1 Tbsp of olive oil between each batch. 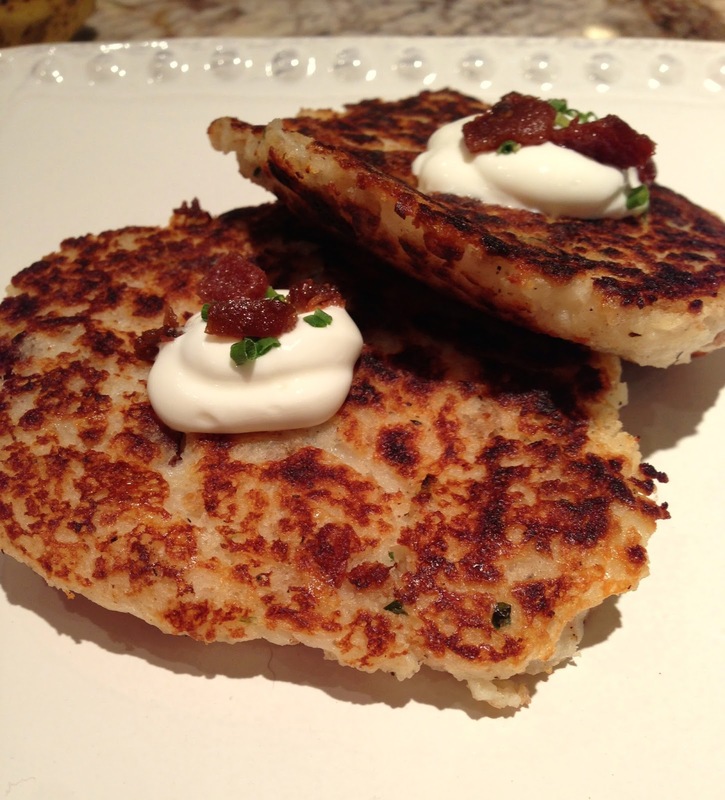 Once all the cakes are cooked, you can top with a dollop of sour cream and a sprinkle of bacon bits to garnish. Serve and enjoy! Potato and eggs are high protein resource which is used for energizing the cell for workout and fitness. The ingredient which are used for making potato pancake have many feature and these are helpful in bodybuilding also.